The 25 yard indoor pool enables us to limit each lane to two swimmers. The pool offers an incredible sealife mural and a large window wall overlooking the sea. The triathlon and duathlon take advantage of the gorgeous ocean road for biking. The run brings athletes out on the pier and along the harbor, taking advantage of our new coastal trail. The kids triathlon is held solely within the City Beachfront Park, never taking them out on open public streets. You cannot find a more beautiful coastal course. Transitions start and end at the same location, next to the pool. Do come join us, bring the family, enjoy our cool summer weather in spectacular scenery! Looking for more race details? 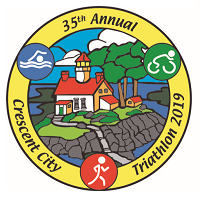 Visit http://crescentcitytriathlon.com/. New this year! Register prior to July 15th to receive a long-sleeved race tee shirt! Availability at the race will be very limited, so register now to reserve yours! The race will be chip-timed by EnMotive. Register before 8:15 to receive confirmed wave starts (available Saturday 5-7 p.m. at packet pickup & registration). Price is per team member. PLEASE READ AND AGREE I know that participating in an organized athletic event is potentially hazardous, and that I should not enter to participate unless I am medically able and properly trained. I HEREBY ASSUME THE RISKS OF PARTICIPATING IN THIS EVENT. I certify that I am physically fit and that I have sufficiently trained. I agree to abide by the competitive rules. I hereby take the following action for myself, my executors, administrators, heirs, next to kin, successors and assigns, or anyone else who might claim or sue on my behalf, and I hereby waive, release and discharge from any and all claims, losses, or liabilities for death, personal injury, partial or permanent disability, property damage, medical or hospital bills, or theft which may arise out of or relate to my participation in this event. I agree not to sue, and to hold harmless any and all persons, sponsors, volunteers, participants or government agencies for any and all claims or liabilities that I have waived, released or discharges herein. I grant permission for all of the foregoing to use any photographs, motion pictures, recordings, or any other record of this event for any legitimate purpose. I understand that the Entry Fees are Non-Refundable/Non-Transferable. By agreeing to this Waiver I certify that I am 18 years of age or older or am the parent or legal guardian of the applicant and make these representations on behalf of my child or ward. In consideration of the foregoing, I, for myself, my heirs, executors, administrators, personal representatives, successors and assigns, waive and release any and all rights, claims and courses of action I have or may have against EnMotive, Crescent City Triathlon, Running Away, LLC and its affiliates, their agents, employees, officers, directors, successors and assigns and any and all sponsors, their representatives and successors, that may arise as a result of my participation in the 2019 Crescent City Tri & Du and any pre- and post- event activities. I attest and verify that I am physically fit and have sufficiently trained for the completion of this event and my physical condition has been verified by a licensed medical doctor. Further, I hereby grant full permission to any and all of the foregoing to use any photographs, motion pictures, recordings, or any other record of this event for any legitimate purpose including commercial advertising, without monetary payment to me.